For centuries, blue and purple dyed fabrics ranked among the ancient world's most desirable objects, commanding many times their weight in gold. Few people knew their secrets, carefully guarding the valuable knowledge, and strict laws regulated their production and use. 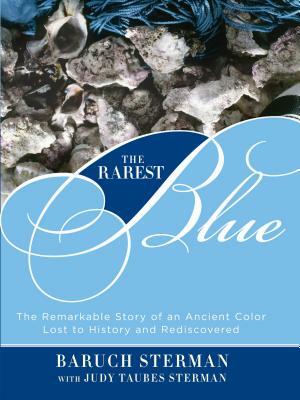 The Rarest Blue tells the incredible story of tekhelet, the elusive sky-blue color mentioned throughout the Bible. Minoans discovered it; Phoenicians stole it; Roman emperors revered it; and Jews--obeying a commandment to affix a thread of it to their garments--risked their lives for it. But as the Roman Empire dissolved, the color vanished. Then, in the nineteenth century, a marine biologist marveled as yellow snail guts smeared on a fisherman's shirt turned blue. But what had caused this incredible transformation? Meanwhile, a Hasidic master obsessed with the ancient technique posited that the source of the dye was no snail but a squid. Bitter controversy divided European Jews until a brilliant rabbi proved one side wrong. But had an unscrupulous chemist deceived them? In this richly illustrated book, Baruch Sterman brilliantly recounts the amazing story of this sacred dye that changed the color of history.